Earlier this year, at the beginning of May, I was walking with my partner from Archway to Crouch End, in north London. Knowing the neighbourhood already better than I did, she was pointing out the area’s architectural highlights to me, mostly buildings from the Victorian and Edwardian era. 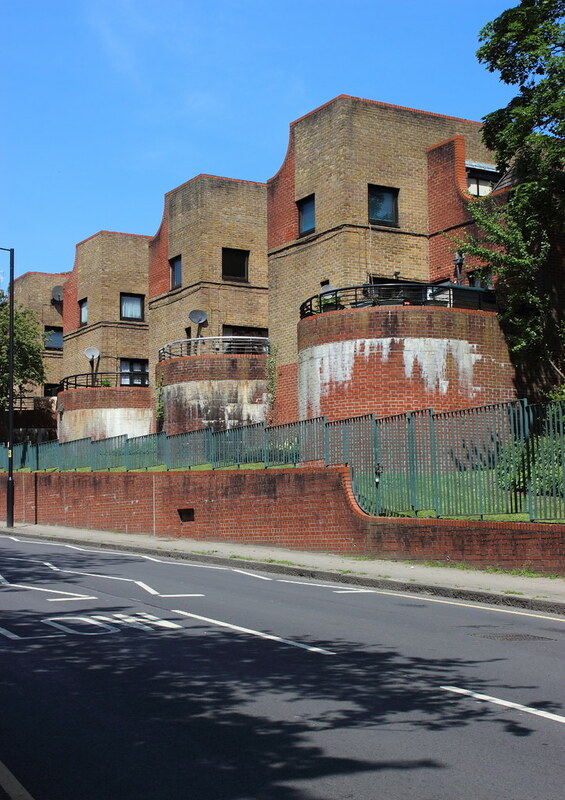 But as we made our way up Hornsey Rise, she drew my attention to a much more recent council estate extending along the east side of the road, saying that she kind of liked it despite its overt postmodernist 1980s look. Now, having both grown up during that particular decade, we share a somewhat ambiguous attitude towards it aesthetics, but I had to agree: those buildings on Hornsey Rise did have a certain quality, so I made a mental note to try and find out more about them… Only a few days later, of course, all major British news outlets announced a list of 17 postmodern buildings that had just received listed status by Historic England; the estate on Hornsey Rise was one of them. 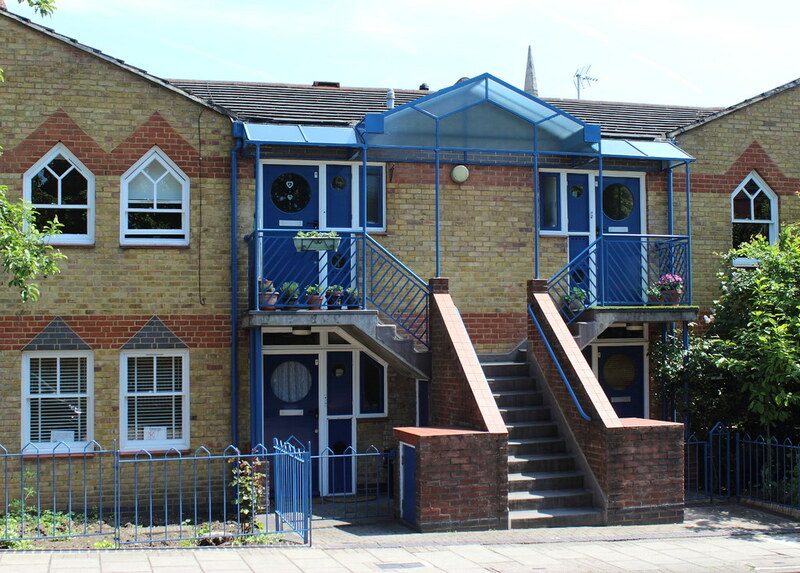 Belvoir Estate, as it’s called, was designed by Gerry Jury of Islington Architect’s Department, under Chris Purslow, and built 1983–1987. 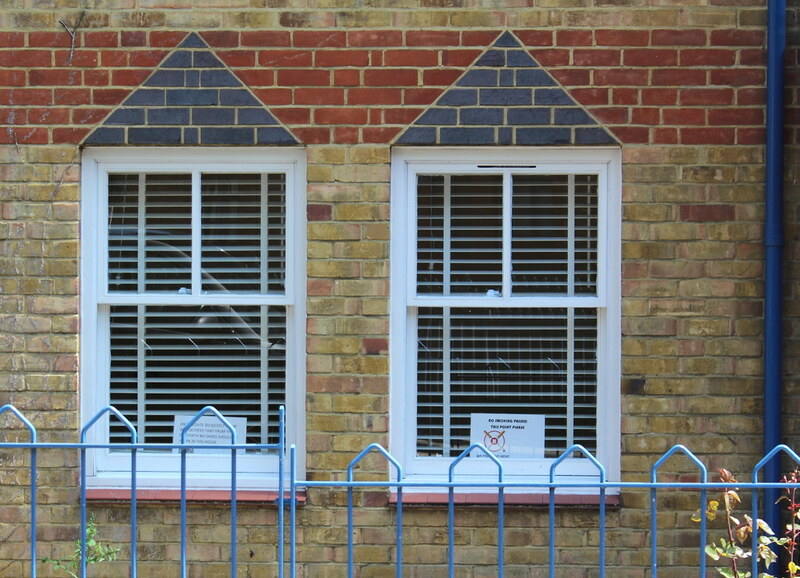 Extending over a roughly triangular site delimited by Hornsey Rise, Hillside Road, and Hornsey Rise Gardens, it comprises a range of buildings in different styles and sizes, from bungalows to almost tower-like three-storey structures. 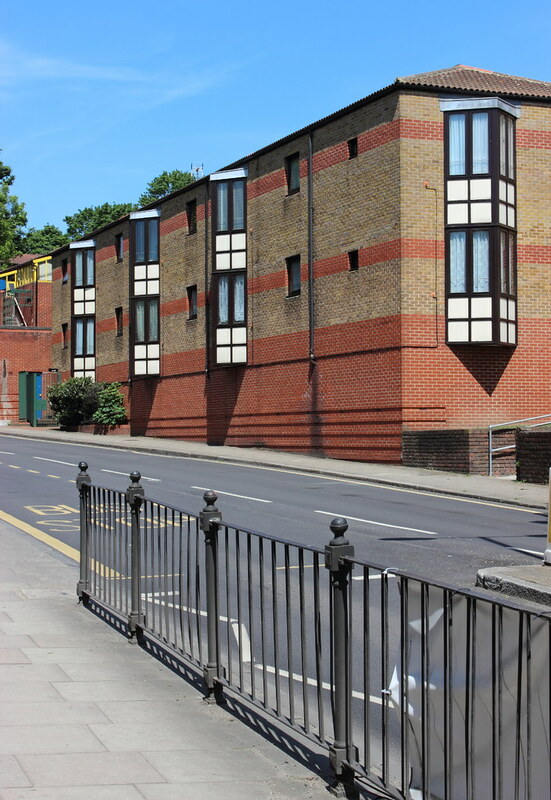 Between them, the estate’s altogether 48 housing units display a rich mix of materials and architectural motifs that has been compared to the aesthetics of the Arts and Craft Movement. 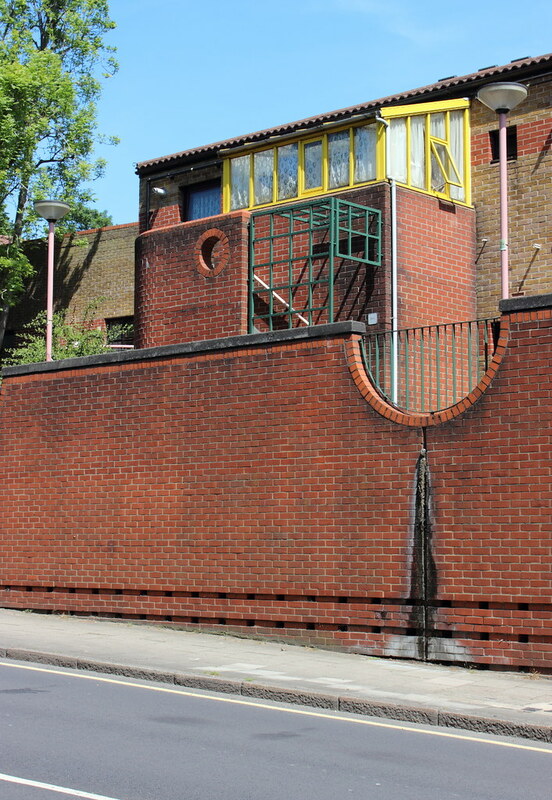 As you’d expect in north London, the main building material is brick, and the combination of the yellowish London stock brick with sections of red brickwork makes for a nice contrast. Even more contrast is provided by the addition of metal canopies and frameworks, painted in bright colours; faux-timber-framed oriels reminiscent of Tudor buildings; pointed windows that bring to mind Gothic or Gothic revival architecture; then again clear lines and curves recalling interwar Modernism. All of these different features are thrown together in an almost playful manner, but the overall effect is anything but hodgepodge. Instead, what characterises Belvoir Estate is an interesting and pleasing interplay between variety and unity. Individual elements and motifs appear on one end of the building complex, then seem to vanish for a while, only to reappear, with subtle variations, at the other end. Thus the architect manages to give the estate a sense of unity, while successfully avoiding monotonous uniformity.